In addition to flying, Earhart published books, wrote newspaper articles, promoted her own lines of luggage and fashion, and became an advisor at Purdue University. 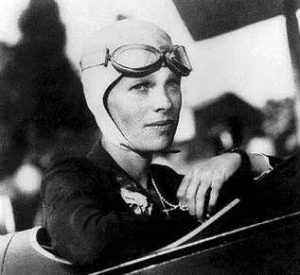 In her review of the movie “Amelia” directed by Mira Nair and starring Hilary Swank, Rachel Abramowitz notes Earhart became “the first woman and second person to fly solo across the Atlantic in 1932. In 1935, she was the first person to fly solo from Hawaii to California and from Los Angeles to Mexico. “What struck me about Amelia was not simply her daring and recklessness and her courage, but the connection between her recklessness and her open vision of what a woman should be interested in doing,” said “Rain Man” writer Ron Bass, who wrote the screenplay with Anna Phelan Hamilton.